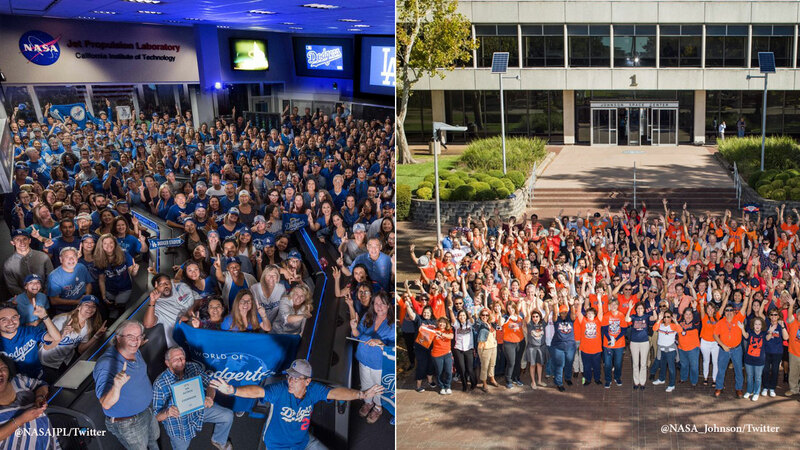 NASA employees at the Jet Propulsion Laboratory in Pasadena, Calif. (left) and the Johnson Space Center in Houston, Texas (right) show support for their teams in the World Series. PASADENA, Calif. (KABC) -- NASA's Jet Propulsion Laboratory in Pasadena and NASA's Johnson Space Center in Houston are showing out-of-this-world team spirit and engaging in a friendly rivalry over their hometown baseball teams competing in the 2017 World Series. In the Los Angeles area, the home to Dodger Stadium, JPL is one of the pillars of robotic space and planetary missions. Houston is home to the Astros as well as JSC, which is the hub of human spaceflight. JSC Director Ellen Ochoa, who is from California, and JPL Director Michael Watkins, who ironically attended University of Texas at Austin, decided to spark a bragging rights wager. The contest is that if the Astros win the best-of-seven series, Watkins will have to wear an Astros jersey for a day. If the series goes to the Dodgers, Ochoa will wear a Dodgers jersey. "And our team is actually named after our space center, so I'm happy to be able to show support for that, and glad to have a little fun in challenging a center that, except for this week, is our close partner in exploration. I am looking forward to seeing a little bit of Houston at JPL soon," Ochoa said in part. The two centers have collaborated and compared notes on a variety of space projects for nearly half a century, according to NASA. In the meantime, fans of the NASA rivalry can follow the duel on Twitter with the hashtag #OutOfThisWorldSeries and on the JPL and JSC social media accounts.